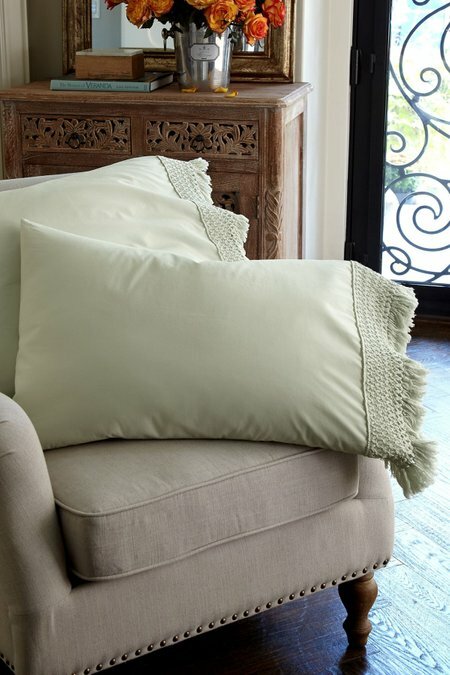 Taking its inspiration from the centuries-old tradition of a bride's trousseau, intricate crochet edging and fringed trim lend heirloom presence to our pristine cotton percale pillowcases. Crafted for us in Portugal and stonewashed for a sublimely soft and lived-in hand, our more global-chic take on the classic trousseau adds another layer of rich texture to the bed. Set of two pillowcases is available in white, morning dew and conch shell. Cases are embellished with intricate crochet & fringed trim. Available in white, conch shell or morning dew. Coordinates with our Trousseau Fringed Sheet Set (sold separately).